Rigol DS4000 100 MHz hackable to 500 MHz? Can the DS4000 100 MHz version be hacked to 500 MHz? I've heard conflicting reports on this, and Rigol only officially sells bandwidth upgrades on the 200 MHz and up versions. However, the 100 MHz version does come with four very expensive 500 MHz probes. I was debating the MSO2072A vs MSO4014, if it can be 'reliably' hacked to 500 MHz I was ever so slightly leaning towards the MSO4000. I don't really need 500 MHz of bandwidth, but the extra two analog channels, VGA video connection, 4GSa/s, and higher wfms/s would be nice to have. I've actually already bought a MSO2072A for $929.25 yesterday, it's in transit right now. 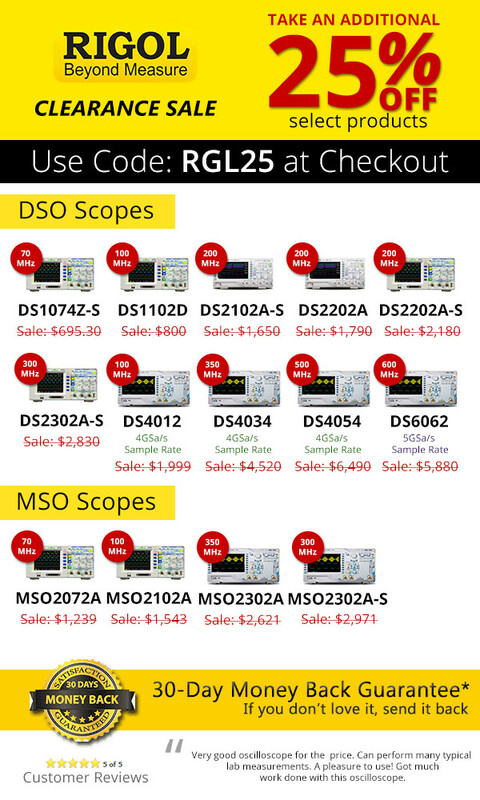 However, I just learned that the MSO4014 is also 25% off, so right now it's selling for $2594. I can afford to spend that much on a scope, cost is not the issue, I just don't know if it's actually worth the extra money. Realistically electronics is only ever going to be a hobby for me, I make my living in IT. Any help on this decision would be appreciated. Re: Rigol DS4000 100 MHz hackable to 500 MHz? So if you can afford $2xxx, why not buying a 200MHz DS4024, and hack it to a DS4054? Because the DS4024 doesn't have a logic analyzer built-in. Although, with 4 channels I suppose you wouldn't need that for things like SPI. Also it's not on sale, psychologically it doesn't feel like I'm getting a good deal. Yes from personal experience it can be done and is reliable. AFAIK it is still possible. The scope itself has an inbuilt 500ps risetime calibration signal which can be used to test it. Historically it was thought to not be possible a couple of years ago. Later a custom firmware was developed to do it (MrKrabs), and later it was discovered be doable simply with keys. My theory is that Rigol released a firmware that permitted bandwidth upgrades, hence the change. The 4GS/s is useful as the analog bandwidth is quite wide - signals well above 1GHz can be seen with reduced amplitude. Be aware that the MSO seems to have some timebase limitations around its decoding which I don't see on the DS4014. There was a conversation here a while back on this with some tests done on the MSO. I did the same test on my DS and found it didn't have the same issue. My casual observation is that MSO owners are quite critical of their scopes, whereas DS owners are generally satisfied. So perhaps you would be better off with the DS and a standalone logic analyser. Well I bought one, so now I have a MSO2072A and MSO4014 coming, I think I have a 30 day return period so perhaps I'll play with both. I totally just blew my budget for an AWG... but I think for this it might be worth it. I've been playing with an Analog Discovery and it's been really helpful in highlighting why I need four channels. Especially while you're still learning, it's really important to get a full view of everything that is happening inside a circuit, because changing the value of a component can completely change the functioning of a circuit. I've only had the Analog Discovery for about two weeks, and I've already gotten frustrated on like 20 occasions with the fact that it only has 2 channels. And that's just playing around with a simple homemade buck converter circuit. 1 channel for the square wave input, 1 channel on the coil, 1 channel on the capacitor, 1 channel on the diode, and 1 channel on the output... err wait, that's five channels... see my point? The other thing the Analog Discovery has taught me is that dealing with a general purpose desktop computer user interface is really quite cumbersome, I'm really glad I followed everyones advise and did not get a high end USB scope. The lag of the USB interface is also very frustrating, you change a setting on the screen and takes like 100+ milliseconds for your instrument to catch up, all the while you're not seeing any output on the screen. It also has very slow wfms/s. The last thing the Analog Discovery has taught me is that I don't 'trust' its readings. When you're a beginner, and have no teacher, you have little clue about what you should be seeing in your circuit traces, so you really have to put a lot of faith and trust that the readings your instrument is giving you is correct. Things like aliasing and bad software math calculations can totally screw up your measurements. On my Analog Discovery I'm seeing all these weird reading that I don't think should be there, but they are there, and I have no clue if they should or shouldn't be there. I have no 'faith' in the instrument, and knowing what I know now I don't think I could have faith in the DS1054Z ether. Did you just set the AuxOutput to Fast to get this signal? Curiously what did you measure it with to find out it is 500ps? Also, I don't notice that changing the output impedance between 1M and 50ohms makes any different in what it outputs. It is also odd in that the top of waveform is near 0V and the bottom is negative. Hmm, I believe I found it in a spec, I'll see if I can find it again. On my scope the rise time measured at around 780-850ps from memory. It was quite good for playing around with TDR type measurements. Yep I found both of those happened on my scope too. can be used in the self-calibration of the oscilloscope"
Thanks for pointing it out - I don't know why I didn't notice it before, but it is handy. Where do I find the 1-to-5 BNC male cable that is recommend in the DS4000 Performance Verification Guide (link below, page 13) to do the self-calibration after I upgrade the bandwidth? Is this step even necessary after a bandwidth upgrade? Thank you. Given that the Rigol RP3500A is a $220 probe (4x = $880), I would like to pickup a second set of cheaper lower bandwidth probes for everyday use. Any recommendations? I was thinking 200 MHz probes would be enough for day to day use. What could a DS4012 be hacked up to? having 500Mhz would be pretty handy for a few things i want to do. They sure do! Found an actual 4012 and its only 2 ports. Thats pretty poor.. but anyway... theres a 4012 avaialble at a very resonable price. Two channels will be enough for what i'm doing anyway. This was the 2nd post?? However i can buy a DS4012 ( 2 channel ) for a very very resonable price, but i cant' get a 4024, or 4014 for anywhere near that. ANd for what im doing, 4 channels wont' help me much anyway.. So, can the 4012 be "upgraded"
AFAIK there is no difference between the 2 and 4 channel scopes in the DS4k range in that regard. Need someone with a 2 channel 4k can confirm, but it's highly likely that you can. This only refers to teh 4014, and not the 4012.... I'm guessing its ok, but its hard to know.. Has anyone done the 2 channel versions? I have not done it on a 2 channel 4012, but I'm about 90% sure it will work. The DS2000 and DS4000 share the same private keys, and the DS40x2 would be the ancestor of the DS2000 series. Worse case you can always open it up and dump the memory via the JTAG header. can somebody, please, finally tell is it possible to convert DS4012 into 500MHz scope? I can at least confirm for the DS4024 that I just received Friday, putting in my serial and RZ99 into the url above in the thread did give me the "Bandwidth 500M" upgrade listed in the installed options after entering the code into the utility options setup.